Brockton Self Storage at 230 Oak St. Located near the intersection of Oak St and Battles St, Extra Space Storage serves residents of Brockton, Avon, South Easton, Abington, Stoughton, and more. Locals will recognize our facility next to CVS and Lincoln Congregational Church. 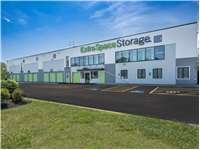 Extra Space Storage on Oak St can accommodate a variety of self storage needs in Brockton with a wide range of storage units, climate-controlled storage, heated storage, and exceptional security! With units ranging in size from 5x5 to 20x13, you can store items large and small with ease at Extra Space Storage! We also have units with convenient features like first-floor access and elevator access. Our Brockton storage facility is equipped with 24-hour video surveillance to provide a safe storage environment and peace of mind for our customers. If you're concerned about storing temperature-sensitive items, we highly recommend renting either a climate-controlled unit or a heated storage unit. Units with climate control maintain an environment between 55 and 80° at all times and are available in sizes 5x5 to 7x10. Units with heating ensure the storage environment stays warm during colder months of the year and are available in sizes 5x5 to 20x13. Intersections - Oak St and Battles St. Building is located behind CVS and Webster Bank. Drive south on MA-28. Turn right onto E Main St. Turn left onto N Main St. Turn right onto Oak St. Our facility will be on the left just before CVS. Drive north on Montello St. Turn left onto E Battles St. Turn right onto Oak St. Our facility will be on the right after CVS. Drive west on Hovendon Ave. Turn right onto Winter St. Turn left onto Howard St. Turn right onto Oak St. Pass Brockton North Middle School then our facility will be on the left. Drive east on Oak St. Pass Fall River Expy and continue straight. Our facility will be on the right after CVS.